*Corresponding author: Mehmet Ozgoz, Akdeniz Universitesi, Dis Hekimligi Fakultesi, Periodontoloji Anabilim Dali, Turkey. Aim: To report on unusual cases of gingival necrosis following the use of a paraformaldehyde-containing paste in root canal treatment. Summary: Paraformaldehyde preparations are toxic to hard and soft tissues. In an era of effective local anaesthesia, toxic devitalising preparations have few applications. However, in a mobile world population severe tissue injury may occasionally be encountered after the use of paraformaldehyde or other toxic agents in some parts of the world. Dentists should avoid such preparations and be alert to the features and management of local toxicity if they encounter it in practice. 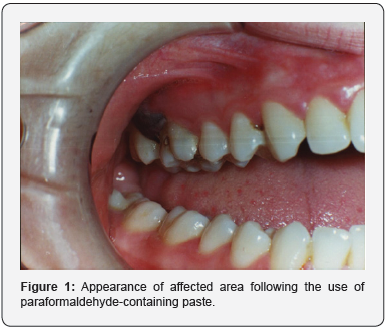 a. Paraformaldehyde-containing pastes have no application in contemporary dentistry. b. Dentists should avoid toxic preparations for pulp devitalisation. c. Dentists should be aware of the features and management of tissue necrosis resulting from the use of toxic dressing materials. Many of the medicaments used historically in root canal treatment have been shown to be cytotoxic . Toxic devitalising agents such as arsenic trioxide (As2O3), a water-soluble compound, forming arsenious acid (H3AsO4) and paraformaldehyde were commonly used in the past to devitalise inflamed pulps when effective anaesthesia could not be obtained . Among these substances an important role was played by paraformaldehyde pastes. In the oral cavity paraformaldehyde agents are used both as disinfectants and to devitalise inflamed pulps when local anaesthesia is ineffective. Despite the clinical benefits paraformaldehyde is not confined to the pulp, but penetrates through dentine and is gradually released as formaldehyde. Formaldehyde released through dentine has a destructive effect on periodontal and bone tissues [3-8]. Formocresol is advocated as an intracanal medicament because of its antibacterial and tissue fixative properties [9,10]. Liquid formaldehyde compounds, such as formocresol may be expressed through patent apical, lateral and accessory canals and cause soft tissue and bony injury within the periodontium [10-13]. Since the advent of effective methods of securing anaesthesia, the use of paraformaldehyde or other toxic preparats for pulp devitalization has declined . However, contrary to the trends within modern endodonties, it has yet to disappear from clinical practice, being advocated in vital primary endodonties and sporadically associated with severe tissue breakdown in adults [15-18]. This article describes the effects on the periodontal and bone tissues of the paraformaldehyde used as a devitalising or disinfectant agent. A 20-year-old female presented to her dentist complaining of pain in the maxillary right quadrant. The practitioner elected to devitalize tooth 16, which had shown signs of pulpitis, with a paraformaldehyde-containing paste since local anaesthesia had been ineffective. Shortly after the placement of the paste, the patient experienced increasing pain and noticed that there was blackening of the gingiva (Figure 1). She was referred to Ataturk University, Department of Periodontology for advice regarding gingival necrosis associated with the distal interproximal area of tooth 16. Clinical examination revealed hard, inflamed gingiva with probing depths not exceeding 3mm on the distal aspect of tooth 16. There was no measurable tooth mobility. Radiographic examination demonstrated expansion of the periodontal ligament and loss of lamina dura distal to the tooth 16 (Figure 2). A decision was made to attempt to preserve the tooth by root canal treatment. Oral hygiene procedures were instituted, and the necrotic tissues were removed from the area. The operative area was irrigated with saline. Root canal treatment was completed, and the patient discharged for 1 week. One week later, there was no distal gingival papilla at tooth 16 and interproximal bone was exposed to a height of approximately 2-3mm (Figure 3). At this stage a coronally repositioned flap was planned in order to remove of the necrotic tissues and to cover the root surface. A sulcular incision was performed initially and then a vertical incision was made between distal aspect of teeth 17 and 15. Exposed necrotic bone was removed with a curette and water-cooled bur. To protect the exposed bone and expedite healing, the affected area was covered with a coronally repositioned flap. The patient was reviewed to check healing. After 1 week the sutures were removed and the operative area irrigated with saline. At 1-year recall, the patient reported that the tooth was functional without any problem. Clinical examination revealed nothing abnormal - no symptoms, no detectable mobility, no periodontal pocketing. The tooth was in functional occlusion. 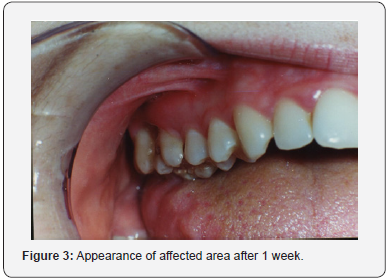 A 35-year-old female with a history of severe pain in the left mandibular molar region was referred for assessment. The patient reported symptoms of irreversible pulpitis around from tooth 36 (Figure 4A & 4B). His general dental practitioner was unable to obtain adequate anaesthesia to extirpate the pulp from this tooth and applied paraformaldehyde paste to effect devitalisation. Subsequently the patient stated that she experienced severe pain, the lower left molar area. She was referred to Ataturk University, Department of Periodontology for advice regarding gingival necrosis associated with the distal interproximal area of tooth 36- 37. Clinical examination revealed hard, inflamed gingiva with probing depths not exceeding 3mm on the distal aspect of tooth 36. There was no measurable tooth mobility. Radiographic examination demonstrated expansion of the periodontal ligament and loss of lamina dura distal to the tooth 36. Despite all the persuasive efforts, the patient decided to extract the tooth and the tooth was extracted. The primary cause of pulpal pathosis is bacterial infection. Without the presence of bacteria in the root canal system, periradicular inflammation will not develop or persist . Consequently, the purpose of root canal treatment is the elimination of bacteria and their substrates from the pulp canal system. During this treatment the pulp is removed and the root canal is cleaned and shaped. Various chemicals used in medicating root canals can create adverse tissue reactions . This fact, combined with the knowledge that the pulp and periodontal ligament are interconnected via accessory canals, dentinal tubules and iatrogenic communications suggests that overzealous use of intracanal medicaments can lead to deleterious effects to the host tissue with resultant postoperative discomfort [20,21]. In the past, effective anaesthesia was either unavailable or rudimentary . 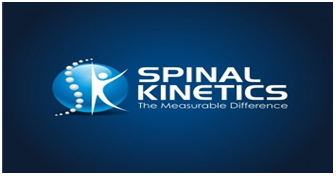 Today there are methods of anaesthesia and reliable anaesthetic agents able to control most pulpal pain for treatment. Therefore, it is unnecessary to use chemicals for devitalising pulps. However, they are still in use and dental complications continue to be reported, even in developed countries [7,13,18]. 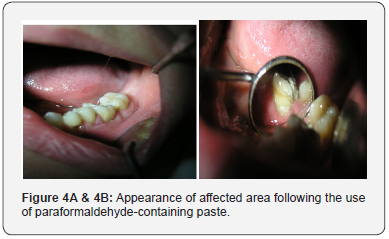 Paraformaldehyde has well-recognised toxic effects, which predictably occur on direct contact with gingiva and bone. The recovery of paraformaldehyde from a sequestrum is an indication of the local distribution of this toxic material in the tissues . In the present study toxic effects of paraformaldehyde was seen on periodontal tissues and the tooth preserved by a combination of periodontal, endodontic and maintenance therapy. As there is no longer either any indication or need to utilize devitalising preparations in dental practice, its continued and unjustified use must be condemned and should be prohibited. However, in a mobile world population, dentists should be aware of such materials and their adverse consequences and be prepared to recognise and manage the tissue injuries that may result from their use. Tortorici S, Burruano F, Difalco P (2007) Maxillary bone necrosis following the use of formaldehyde containing paste: management and case series. Br Dent J 203: 511-512. Ozmeric N (2002) Localized alveoler bone necrosis following the use of an arsenical paste: a case report. International Endodontic Journal 35(3): 295-299. Kunisada M, Adachi A, Asano H, Horikawa T (2002) Anaphylaxis due to formaldehyde released from root-canal disinfectant. Contact Dermatitis 47(4): 215-218. Ehrmann EH (1963) Root canal treatment with N2. Australian Dental Journal 8(5): 434-438. Rappaport HM, Lilly GE, Kapsimalis P (1964) Toxicity of endodontic filling materials. Oral Surgery Oral Medicine and Oral Pathology 18: 785-802. Barker BC, Lockett BC (1972) The effect of N2 and other paraformaldehyde preparations on dog pulp. Journal of Dentistry 22(9): 329-338. Stabholz A, Blush MS (1983) Necrosis of crestal bone caused by the use of toxavit. J Endod 9(3): 110-113. Di Felice R, Lombardi T (1998) Gingival and mandibular bone necrosis caused by paraformaldehyde-containing paste. Endod Dent Traumatol 14(4): 196-198. Wesley DJ, Marshall FJ, Rosen S (1970) The quantition of formocresol as a root canal medicament. Oral Surg Oral Med Oral Pathol 29(4): 603- 612. Powell DL, Marshall FJ, Melfi RC (1973) A histopathologic evaluation of tissue reactions to the minimum effective doses of some endodontic drugs. Oral Surgery Oral Medicine and Oral Pathology 36(2): 261-272. Cambruzzi JV, Greenfeld RS (1983) Necrosis of crestal bone related to the use of excessive formocresol medication during endodontic treatment. Journal of Endodontics 9(12): 565-567. Jakhi SA, Parekh BK, Gupta S (1983) Phosphorus necrosis of the maxilla. Journal of Oral Medicine 38(4): 174-176. Yakata H, Azumi T, Kawasaki T, Nakajima T (1985) Extensive osteolysis of the mandible following devitalization of a tooth by arsenic trioxide. Journal of Oral and Maxillofacial Surgery 43(6): 462-465. Bataineh AB, al-Omari MA, Owais AI (1997) Arsenical necrosis of the jaws. International Endodontic Journal 30(4): 283-287. Martinez Sarda JA (1968) Endodontic treatment and the conservation of deciduous teeth. International Dental Journal 18: 537-545. Grossman LI (1976) Endodontics 1776-1976: a bicentennial history against the background of general dentistry. Journal of the American Dental Association 93(1): 78-87. Cruse WP, Bellizzi R (1980) A historical review of endodontics, 1689- 1963, part 1. Journal of Endodontics 6(3): 495-499. 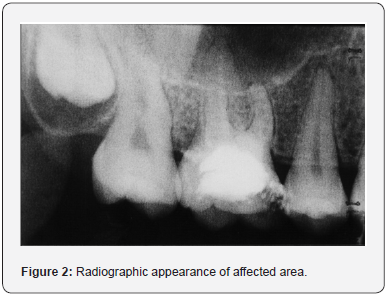 Smart ER, Barnes IE (1991) Tissue necrosis after using an arsenical endodontic preparation: a case report. International Endodontic Journal 24(5): 263-269. Lin L M, Rosenberg P A, Lin J (2005) Do procedural errors cause endodontic treatment failure? J Am Dent Assoc 136(2): 187-193. Marshall FJ, Massler M, Dute HL (1960) Effects of endodontic treatments on permeability of root dentin. Oral Surgery Oral Medicine and Oral Pathology 13: 208-223. Taylor GN, Madonia JV, Wood NK, Heuer MA (1976) In vivo autoradiographic study of relative penetrating abilities of aqueous 2% parachlorophenol and camphorated 35% parachlorophenol. Journal of Endodontics 2(3): 81-85.